Wednesday morning and I’m in Johnson County, Kansas, a southern suburb of Kansas City. While I’m originally from the Bay Area, my parents grew up around here and that is where many relatives still live. I lived here in Kansas City for fourteen months in between living in the Bay Area and moving to Khrungthep, Thailand. It was a good experience, both to spend good time with my family and also to get an opportunity to live elsewhere in the US and see another perspective on the American way of life. This week has been largely about family time along with a little time for friends. My 3-year old niece, Emily, has been showing signs of regressing now that she has a brand new, 3-week old sister, Ava. She seems to really love her new sister, but is definitely starving for attention anytime she sees Ava getting too much of it! Late March is a bit of a triple event for us: My grandparents’ anniversary (63 years this year, I believe. Wow! 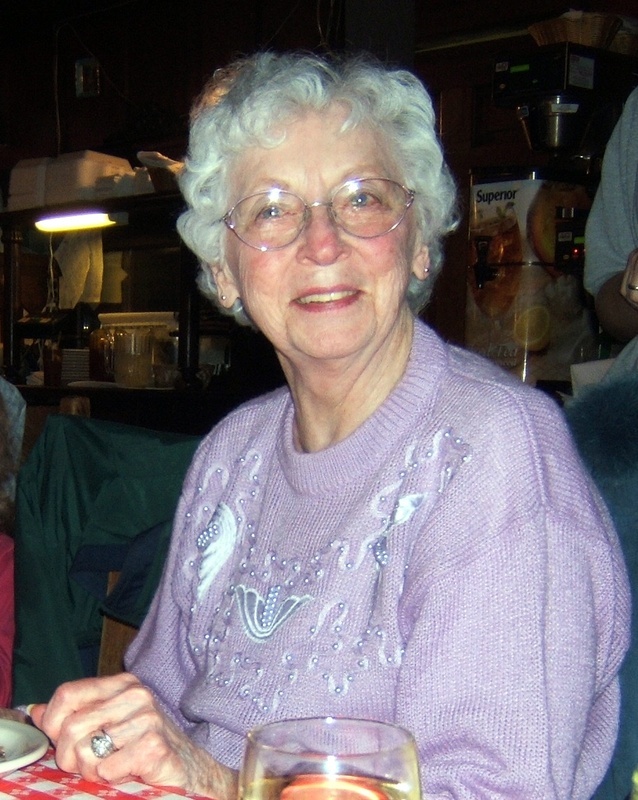 ), my grandmother’s birthday (young and active for her age), and Emily’s third birthday. So this was a good time to be here. My aunt and uncle were in town from California along with my cousin. 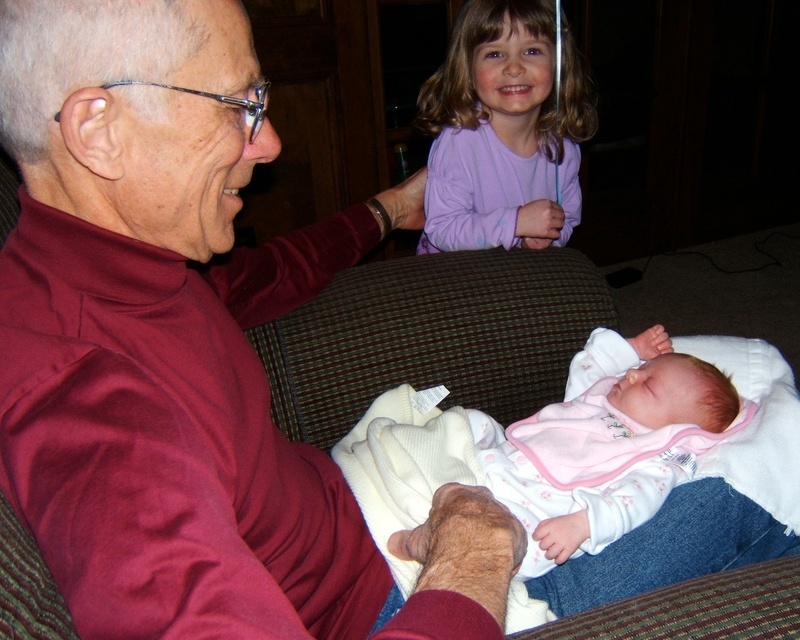 From left to right: Dad, Emily and Ava; Grandpa and Ava; my cousin with Ava; Grandma at her birthday dinner. Is it any wonder Emily would think that she isn’t the center of the world anymore? 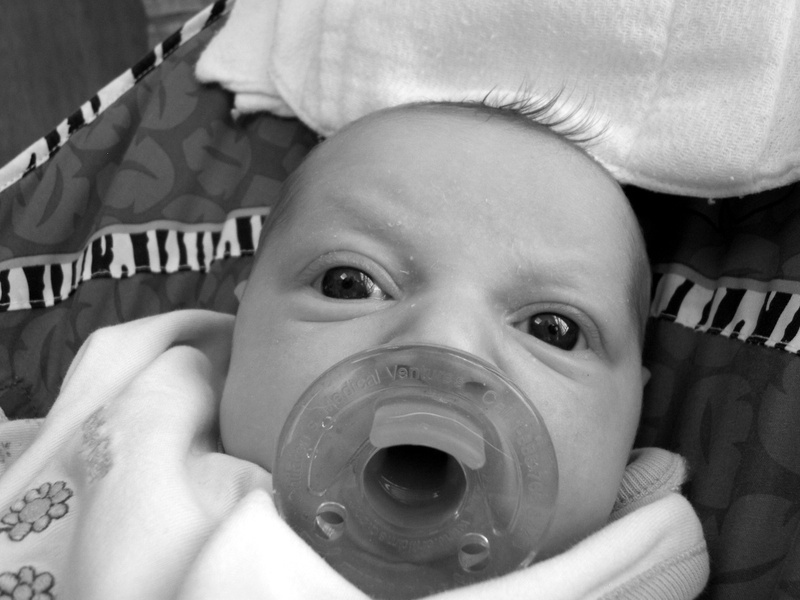 Her face time has dropped considerably in this blog since Ava came along. This week I’m playing the role of personal chef for my sister and brother in law, loading up at Costco on pork chops, salmon, and a pillow-sized bag of spinach. Salads daily. Cupcakes tomorrow to take to Emily’s day care class for her birthday party. Yeah – I get to bake again! Tuesday evening I had dinner with a former colleague. He is now living in Kansas City and will be moving down to Mexico City to be with his partner at the end of May. The dinner conversation was really enjoyable; expats and about-to-be expats in multicultural relationships have a lot to talk about. This afternoon I took some time off work and have helped Jenn get some projects finished (birth announcements) and will complete my taxes. Then dinner over at Grandma and Grandpa’s house. They purchased a lot of food, expecting that my aunt and uncle were going to stay with them. Instead, they stayed at a hotel and didn’t eat enough meals at home, so Grandma has a refrigerator full of food. So dinner is over there tonight. So after eight very intense days of film festival operations, it is over. Just as a town in the aftermath of a tornado, my mind is a scattered mess. It was a very fun ride, though. Over lunch the day after with a former festival colleague, I came to the conclusion that something that I’m experiencing less of in Bangkok than I did here in the States is intellectual stimulation. Through a combination of schedules and circumstances and just getting settled in to life there, Tawn and I don’t have a lot of people around us who are interested in things like films, theatre, books, lectures, travel, etc. There are also very few people around us who are engaged in the arts, nonprofit organizations, or other causes that are driven by passions and convictions. These few weeks here in SF reminded me of the sense of engagement and vitality that is largely absent in our lives right now. Tawn and I have talked about this before and have considered ways to build more of this into our life. Of course between full time jobs, studying, yoga, and visiting Tawn’s parents, I’m not sure where exactly the time comes from. But as I leave San Francisco, while I do know that I’m glad I don’t live here anymore, I also know that there’s work to do to further develop my life in Khrungthep from being just a place I live with my husband to a fertile field where I can grow as a person at all levels. Closing night party and film was at the Palace of Fine Arts, built for the 1915 Panama-Pacific International Exhibition. The closing film was “Journey From the Fall“, the first major American film to dramatize the traumatic aftermath of the Vietnam War from the Vietnamese perspective. While I wasn’t able to attend the film, working at the Kabuki for the last two shows, I had seen much of it during a jury screening earlier in the week. It is emotionally powerful and I heard from audience members who had experienced the flight from Vietnam first-hand that it really did capture the experience very well. The party was held in an adjacent space and was very well attended. The audience awards and the juried awards were presented – “Water” by Deepha Mehta won the audience award for best feature while “Colma: The Musical” (see previous entry) by Richard Wong won the jury award for best feature. Off to Kansas City this morning for a week with my family. Brian, Jay, Newton, Masashi, Mabel, Jackie, Ed, Paul, Chris, and me. 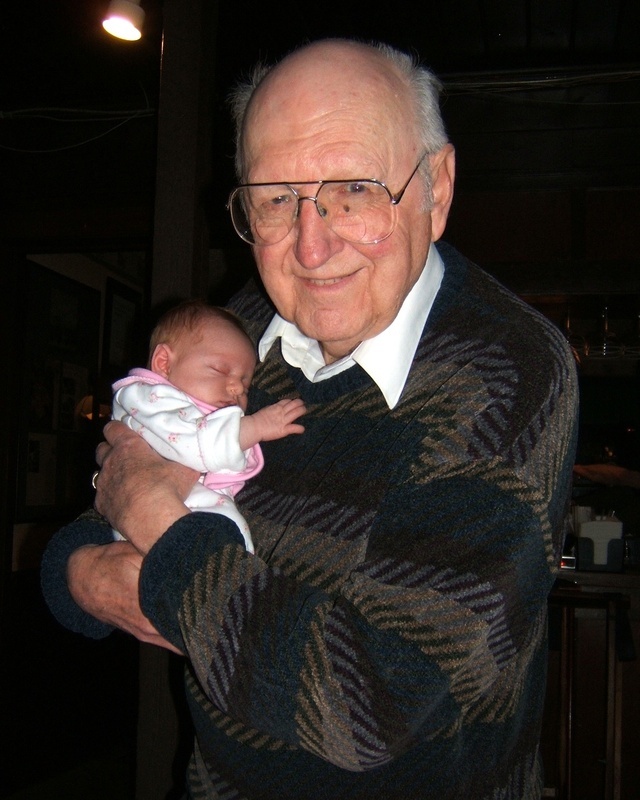 Left: L.A. Renigen and H.P. Mendoza from “Colma: The Musical” Right: The cast and crew from “Colma: The Musical” with festival staff members after winning the jury award for best feature film. 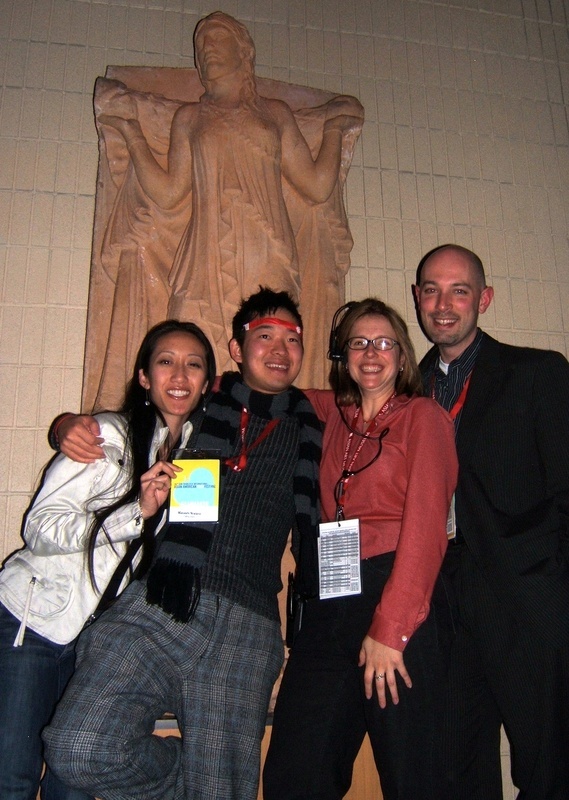 Film Festival staff members: Mabel, Masashi, JC and me at the Palace of Fine Arts. By some yard sticks (meter sticks – need to transition from imperial to metric) Tuesday night’s film festival operations were not incredibly busy. But by other measurements, the day was really packed. Of the eight shows Tuesday night, only two were sold out. But both were the back-to-back 700 seat auditoriums and the first show started 10 minutes late and Q&A ran long afterwards. So we had 400+ people lined up in the hallways outside of the auditorium. For those of you who’ve been to the Kabuki, you know how small that space is. For those of you who don’t, it’s a hallways about 150 feet long by 20 feet wide. And about 300 people had to pass through that area to get to the two auditoriums at the far end of that hall. Upstairs we have a 80 x 20 foot space where about 200 of the people queued up for the balcony. Madness. No comparison to tonight, where of the eight shows, five are sold out including both the large house shows. 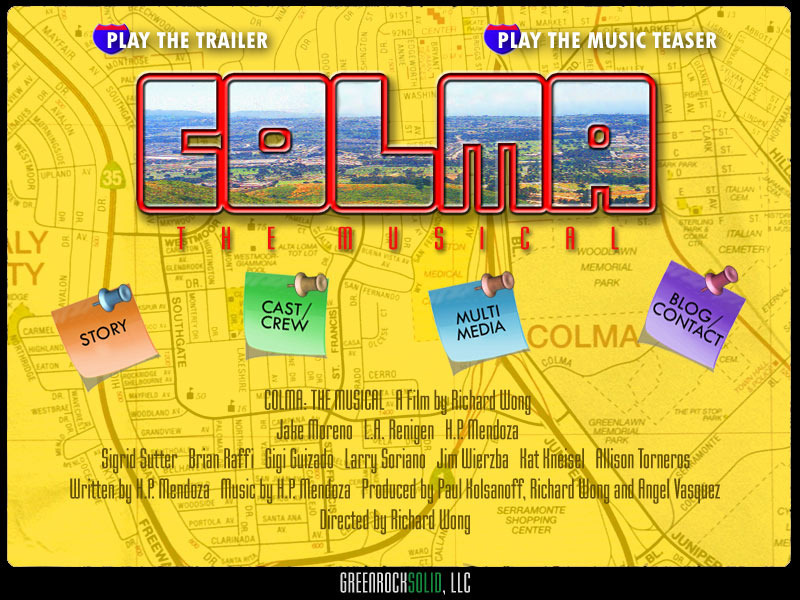 But the highlight of the night was the world premier of Colma: The Musical (film by Richard Wong and music, lyrics and story by H.P. Mendoza). For those who don’t know the Bay Area, Colma is a small town of 1100 between the City and the airport. It is home to the cemeteries where San Francisco’s dead are buried. There isn’t much else there except the Serramonte Mall, two Targets (yes, two! ), and recently an In-N-Out Burger opened next door to a Krispy Kreme donuts. Billy is a young actor with big dreams. But there is nothing big about Colma. He is faced with the choice between the easy: being complacent and ending up in a dead end job; or the selfish: going after his dreams regardless of how it affects the people who care about him. 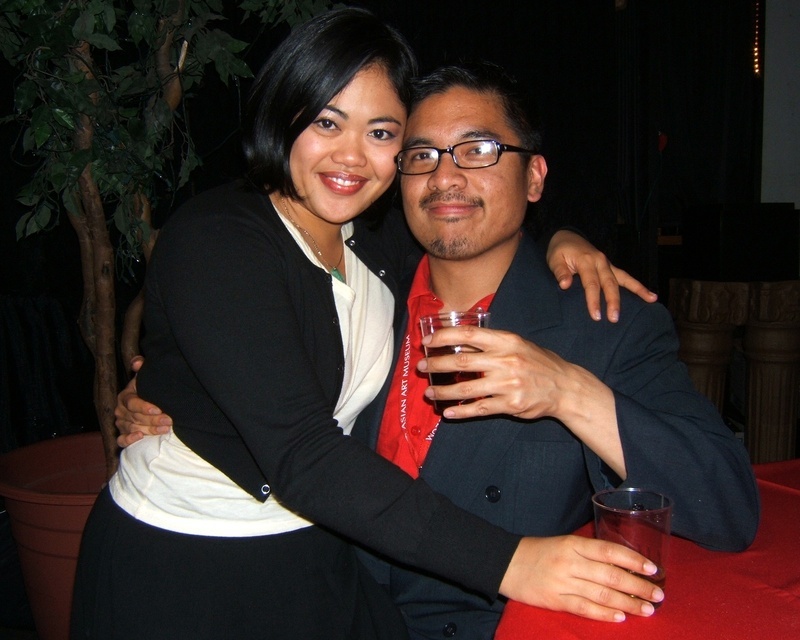 Rodel can be the life of the party – if he feels like it. But at home, with his brother in prison, he carries the pressure of being the “good” kid in his family. Coupled with the loss of his mother, Rodel finds his already waning relationship with his father further strained by a secret he desperately keeps from him. Maribel basks in her youth and embraces its carefree lifestyle. Turning 19, she begins to realize that youth, like everything else, is temporary, and starts to question whether being young is based on one’s age, attitude or actions. Together, they unwittingly begin the lifelong process of self-discovery and self-reliance – But at what expense? The thing that really steals the show is the music. CDs were available for sale after the show and 18 hours later, the grooves in the disc are noticeably deeper as I’ve been listening and re-listening to the tracks. Many of the songs are highly infectious. It was really fantastic in the style of Hedwig and the Angry Inch. I don’t know if Richard and HP will find a distributor, but hope they will. With some further development I think this could be a really successful stage musical. A lot of the success of the Festival can be attributed to the great volunteers. Literally hundreds of people give their time and in theatre operations we have a special group of about a dozen volunteers who work as our House Managers. They actually have their radios and headsets on, coordinating the start of each show, ensuring the audience is seated, guests are located, introductions are made, Q&A sessions are timely, etc. It would be difficult to run the Festival without them. Paul, Mabel, and Serena are three of those House Managers. They’ve all volunteered for several years now and last night after the last show we went up to the Colma: The Musical after-party where they made silly faces for the camera. I miss Tawn. Still eleven days to go before I’m home in Bangkok. 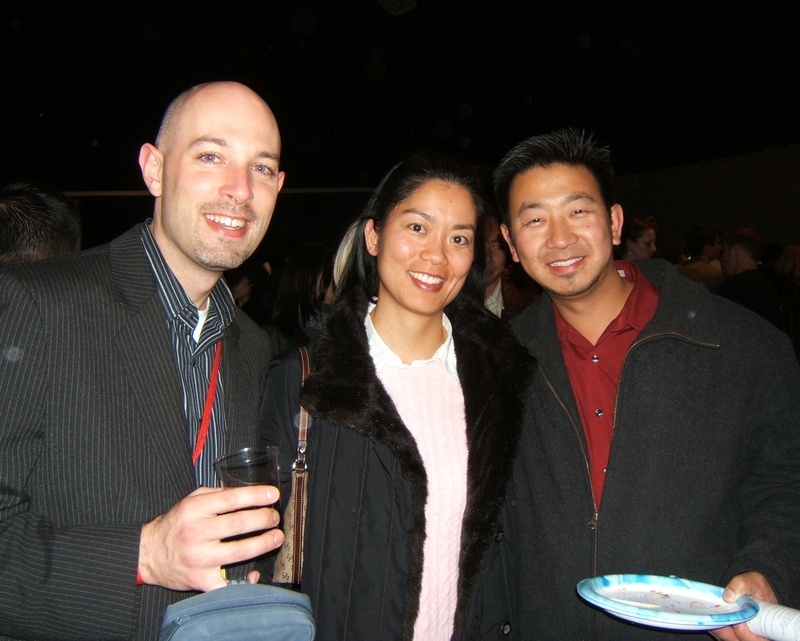 Last Tuesday or Wednesday, so long ago now I can’t remember, I was able to meet up with Ryan (the high school friend with whom I went to Viet Nam a week before coming to San Francisco) and his girlfriend Sabrina. Ryan picked me up at the Film Festival’s office on Ninth Street and then we met Sabrina at the restaurant, the Cuban tapas restaurant Cha Cha Cha. Cuban food is one of those “not in Khrungthep” sort of things, so as many trips as I can make there this week, I will. Sabrina is just really fantastic and it was so nice to meet her. No pictures to post, unfortunately, but I think they’ll be attending the closing night so I’ll take some then. On Sunday (or Saturday, perhaps?) Paul and I drove over to Fremont to meet up with Bruce and Howie at one of my favorite Malaysian restaurants, Red Kwali. “Kwali” is the Malay word for wok and the restaurant specialises in authentic hawker-style food. In Malaysia and Singapore, there are food courts called hawker centers where each individual stand is owned by a different vendor and his/her family. The food was good, despite the third or fourth ownership change in the past two years, and it was especially nice to visit with Bruce and Howie. They’ve been incredibly busy, Bruce completing his MBA and Howie has finally received his green card! 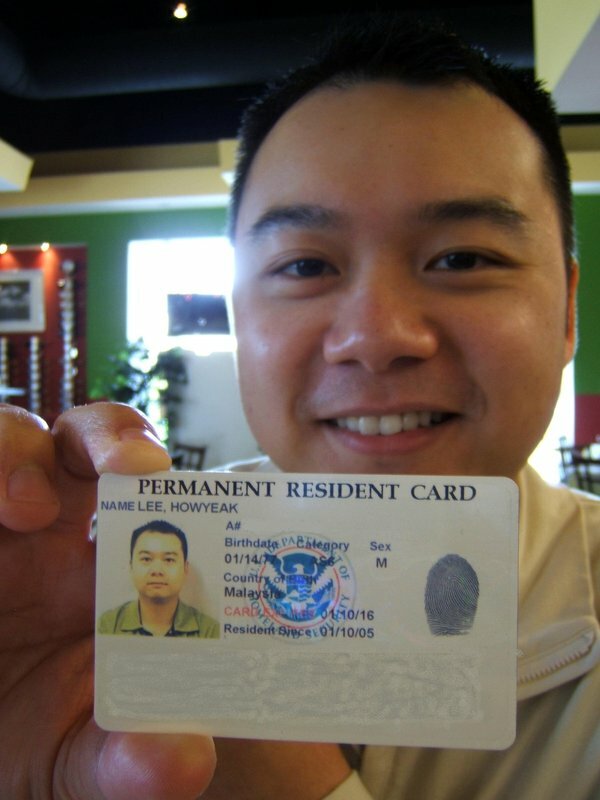 Yeah, he can now leave the US on vacation with relative ease. They’re talking about a trip over to Taiwan to visit Howie’s parents and then on to Bangkok this Summer. It would be so fun to have them visit, so Tawn and I will keep our fringers crossed and hope to see them soon. 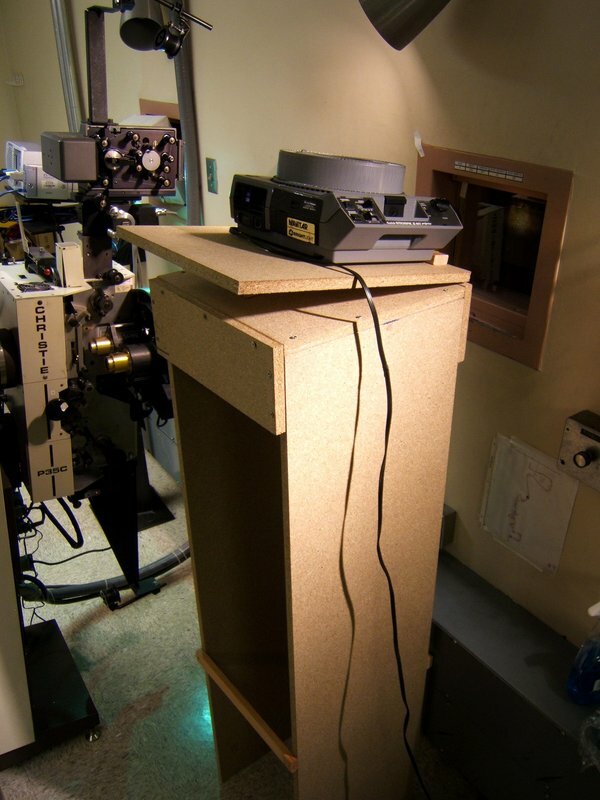 The week before the Festival, I was assigned the task of building stands for the slide projectors. We use these projectors to show slides of sponsors’ logos and names prior to the start of the show. Previously, the movie theatre where we operate used slides for their pre-show entertainment, so we could just put our own slide carosel on screen, instead. However, AMC went to an all digital pre-show program and the old slide projectors are gone. The new digital projectors are bolted into place so we can’t move them, and the costs of going digital this late in the game were too high for the Festival. So this necessitated finding a way to mount our rented slide projectors so they could shoot through the port window in the projection booth. Digging back into my drafting roots from junior high and high school (thanks, Mr. Geraci!) I came up with a design and after pricing it out, worked with two volunteers to purchase and construct the stands. The finished product is a bit rickety – I had to buy some additional 1×2’s to add structural support to the stands that are 5 feet tall – but overall they work just fine. This year’s opening night film was Eric Byler’s “Americanese“, adapted from the novel “American Knees” by Shawn Wong. Eric did last year’s indie success “Charlotte Sometimes” and is a promising young director. 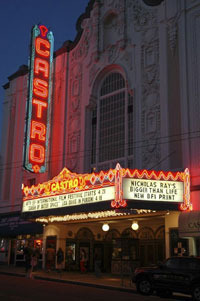 The Festival uses the charming and historic Castro Theatre for our opening night film along with several spotlight presentations over the opening weekend. It’s majestic 1500-seat auditorium complete with Wurlitzer organ is a great setting for big events. My responsibility was to handle crowd control outside the building. Opening night was sold out and we had a rush line outside (people waiting to see if any seats open up at showtime) and we also had some of the most torrential rain that I have ever seen in San Francisco. It even hailed for about half a minute. Yikes! It turns out that the gorgeous canopy that hangs over the sidewalk, leaks. A lot. In my nice suit with a radio and a secret service style headset, I worked the crowd, getting people inside in a timely fashion and starting the movie only a few minutes late. And by the end of it, I was soaked. My jacket was completely soaked, my shoes and socks and the lower half of my legs were soaked. Wet, wet, wet. Before heading out to the opening night party I stopped by Anita’s house (thankfully I was staying only a few blocks away) to change into dry clothes. Otherwise, given the frightfully cold night, I think I might have caugh pneumonia. 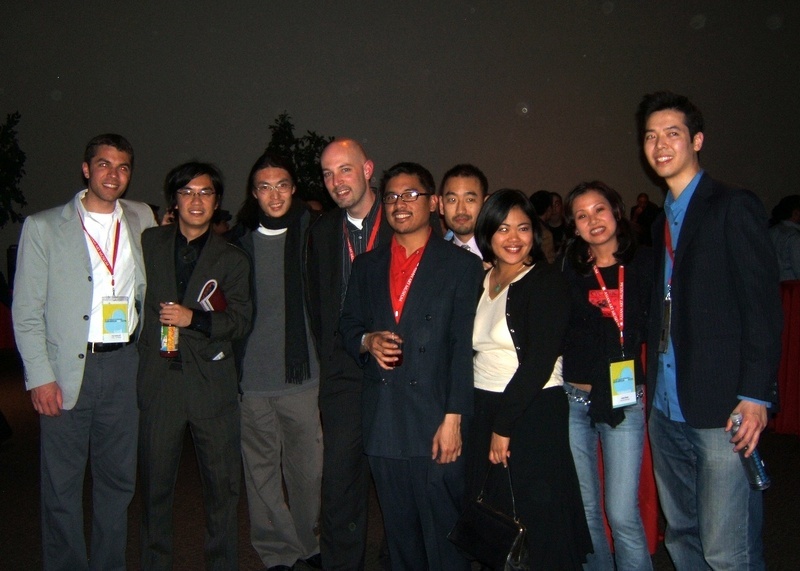 The party itself, held at the Asian Art Museum, was a grand affair spread between all levels of the building. The galleries were open, so it was a nice opportunity to take in some art in between bites of food and sips of wine. Housed in the former public library, a Beaux Arts-style building that graces the civic center plaza, the meseum is one of the most beautiful cultural treasures in the city. Tired and exhausted, I didn’t feel very chatty and so chose to wrap up the evening pretty early. Especailly since Tawn was back in Khrungthep. Parties aren’t as fun without a loved one to share them with. The Festival has run smoothly with a few interesting events. 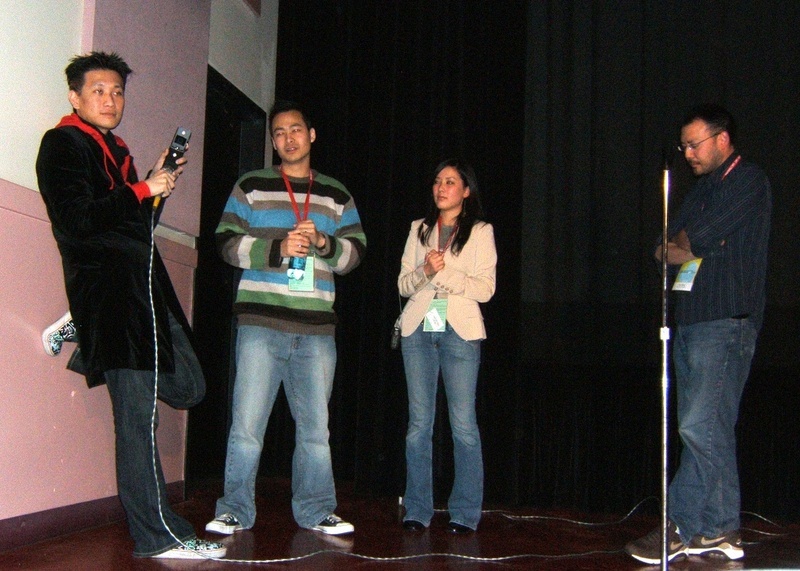 Director Abraham Lim, who I got to know a few years ago when his film “Roads and Bridges” played at our festival, was back with his follow-up, “The Achievers“. Abe’s in post-production, still tweaking this film. So we had a Friday evening show at a few hours before we didn’t have a copy of the film. At first, Abe was going to drive up from LA. Then one of his producers had a backup copy on video that he was going to get to us. Finally, three or four of his cast members pitched in and bought Abe a plane ticket, and he arrived about 15 minutes before the show with the copy of the film we were to show. After the show, Abe went back down to LA and spent Saturday tweaking the audio soundtrack, not satisfied with various minor details that appeared very noticable to him but which I think the audience probably wouldn’t notice. By Saturday evening I was on the phone with him, answering questions about ways we could potentially hook his iMac laptop directly into the video projection system and run a parallel audio soundtrack. Sunday morning about 5 am, Abe left LA and drove back up to San Francisco, arriving at the theatre about 11. He met with our video projectionist, discussed some more options, and then spend the next eight hours in one of the offices continuing to tweak and edit the soundtrack. Our projectionist was getting a bit worried about trying something radically different without the opportunity to actually test it out. So about thirty minutes before the second showing, Abe finally decided that we’d stick with the tape that was used Friday night. 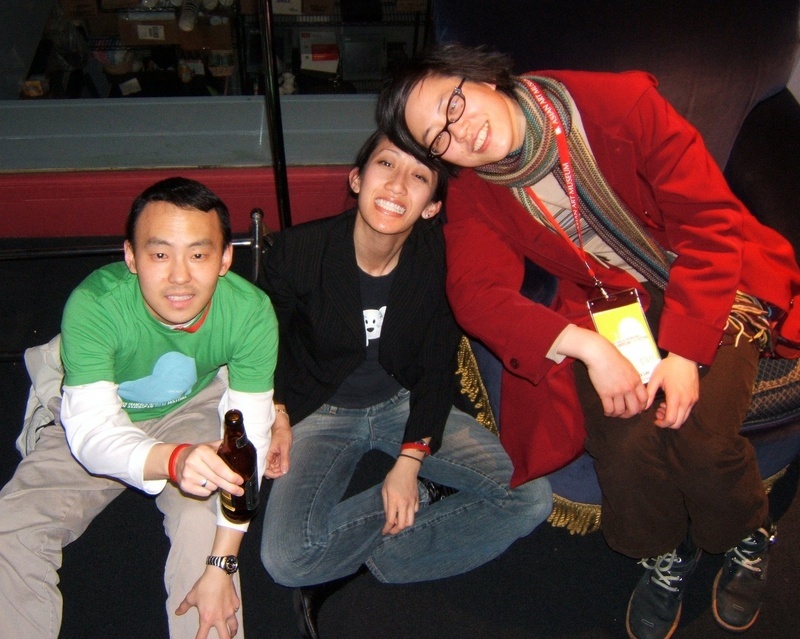 One of the more popular films was a documentary by director Todd Angkasuwan about rapper Jin Au-Yueng, perhaps the most popular Asian-American rapper, and his eight-city tour of Asia. The crowd of young fans was disappointed that the rapper himself wasn’t able to attend, but during the post-movie question and answer session, Todd called Jin on his mobile phone and held the microphone up to the phone so everyone in the audience could hear. And thus, Jin was able to be there for Q&A. Don’t Book the Bangladesh Film Festival! Last night we had a show of “Gaijin 2” an epic Brazillian film about the Japanese-Brazillian experience early in the 20th Century. The print had been sent to us from the Bangladesh Intenrational Film Festival and didn’t clear customs until yesterday morning. Upon building up the seven-reel film, another of our projectionists discovered that reels 5 and 6 were from other films. Yes, not only did they mix reels (which as a former projectionist I can tell you takes a bit of effort) but those two wrong reels were from two different movies! Momentary panic ensued but by the time I arrived some sense of calm had been restored, as we had a VHS copy of the movie as a preview tape. The decision was made to screen the film on VHS and explain beforehand that the quality was not as high as we wanted. 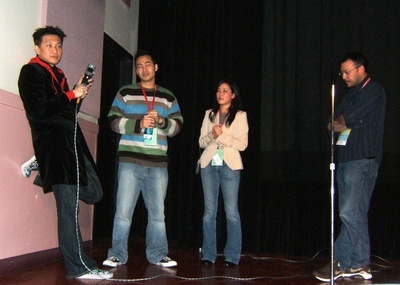 People were offered refunds or the opportunity to watch other films. In the end, I think that nobody took that offer and everyone stayed and enjoyed this great movie. In his first business trip in several months, Tawn arrived in Macau today for an HP press event, acting as chaperone for several members of the Thai media. He reports that it is cool and overcast and that Macau doesn’t appear to have anything to see or do other than go to casinos. 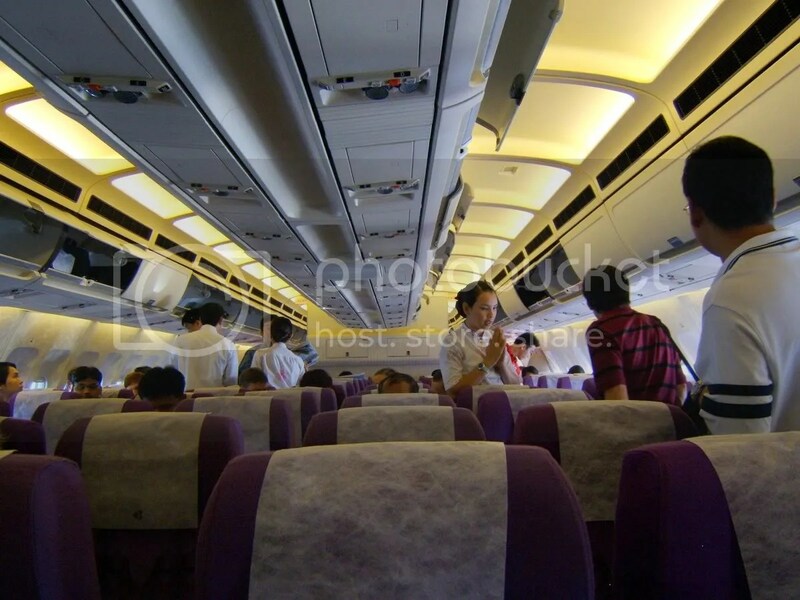 Smartly, he booked to fly into and out of Hong Kong, which will give him almost a full day on Thursday to shop and sightsee. 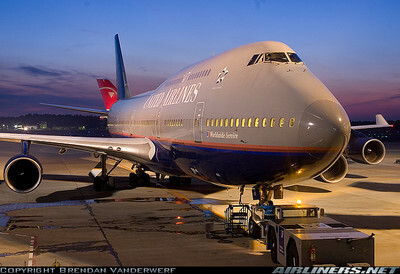 The trip report for the journey to Saigon that Tawn, Ryan and I took has been posted on airliners.net. You can click HERE to read it. The movie is a faux documentary, supposedly produced by a British broadcasting company. It takes a look at an America where the South won the Civil War. The movie is built to look like a film that is being shown, controversially, for the first time on television in the States – complete with the TV introduction beforehand and commercial breaks throughout that serve to drive home the points the real film is making. “Beginning with the British and French forces joining the battle with the Confederacy, thus assuring the defeat of the North at Gettysburg and ensuing battles, the South takes the battle northward and form one country out of the two. “Through the use of other fabricated movie segments, old government information films, television commercials, news breaks, along with actual stock footage from our own history, a provocative and humorous story is told of a country which, in many ways, frighteningly follows a parallel with our own. “After victory, President Davis brings slavery back to the northern states by offering a tax rebate to businesses and households who will buy and own them. Liberals move to Canada. The nation chooses an expansionist policy and conquers Cuba, Mexico and South America. “Through it all, we follow a political dynasty, the Fauntroy family, who lead the country through its triumphs and tragedies. Really, it is a shocking film because it takes something that we might initially dismiss as a preposterous thesis, and thinks it through very carefully. The end result is that we’re able to look at many of the stands our country takes, ostensibly on the moral high ground, and recognize that there is a veneer of hypocrisy to them. I’d encourage you to see the movie if it is playing at a cinema near you. This morning I received a call from my sister, who on Sunday gave birth to my second niece, Ava. 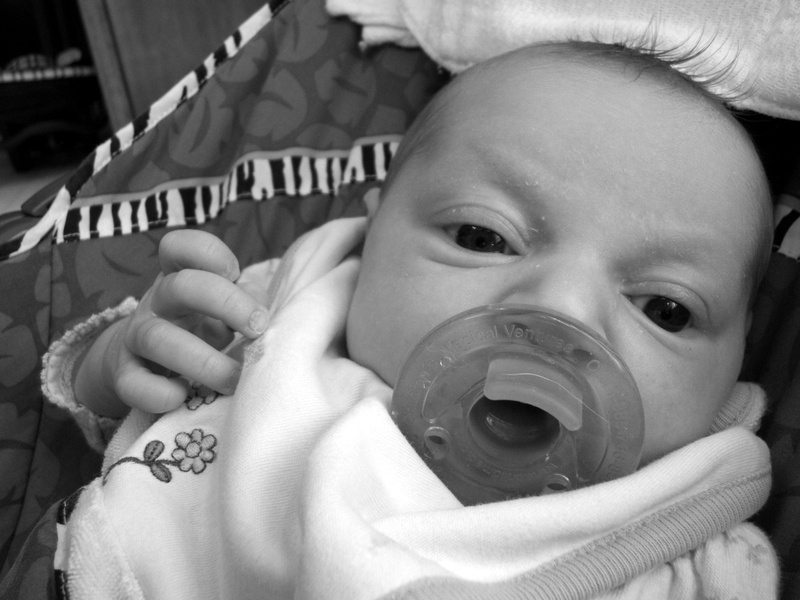 While my sister has been released from the hospital, Ava is still in neo-natal intensive care. It seems that she is experiencing a problem with the valve from her stomach into the rest of her digestive track. Basically, the contents of her stomach aren’t draining as quickly as they should. Doctors are trying different things, looking for a non-surgical solution. One is low doses of a muscle relaxant, in the thought that the muscle that controls this valve may be spasming. Another option is to go in for surgery, but of course this would be after non-surgical options are attempted. 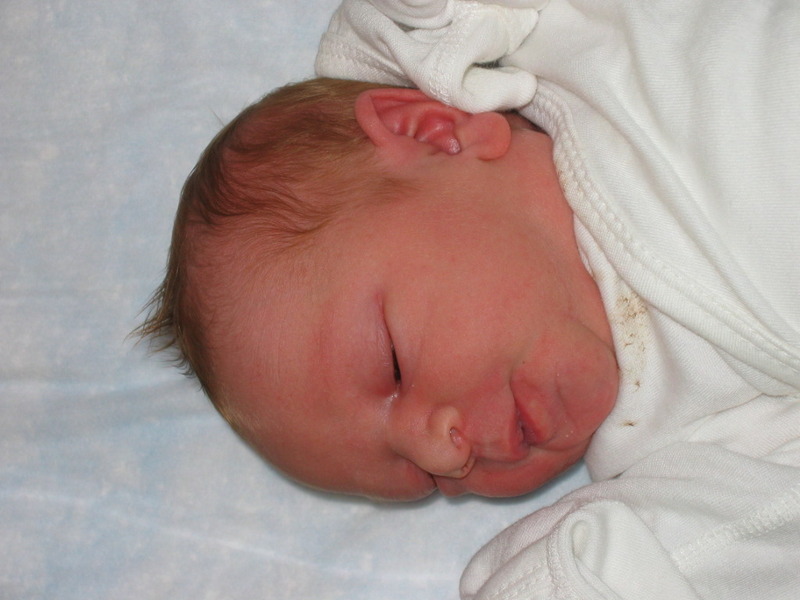 While Jenn didn’t remember the name of this ailment, it is “not uncommon” in baby boys but is more uncommon in baby girls. Nonetheless, the primary doctor handling the case has seen it before. So that’s the factual side of things. On the other side, Jennifer is worried, of course. But at the same time, looking at the challenges that some of the other infants in ICU are facing, Ava is in much better shape. It is frightening, though – you come to expect a perfectly healthy baby and you feel so powerless because there isn’t a thing you can do to help her. Aside from that, Emily (niece #1 just a few days shy of 3 years old) is very unhappy that her mother hasn’t had much time for her as of late. Without a doubt, she’ll face some continued disappointment at not being the center of the universe. But she’ll get over it in time. I’ll be there later in the month and will make it a point to spend some time with her so she knows how special she is. And also, maybe take on some babysitting duties so Jenn and Kevin can get out of the house. San Francisco continues to be unbearably cold. The rains picked up again this afternoon after some beautiful sun and blue skies. But the wind has been gusting all day and the windchill is now at freezing. Yucky. 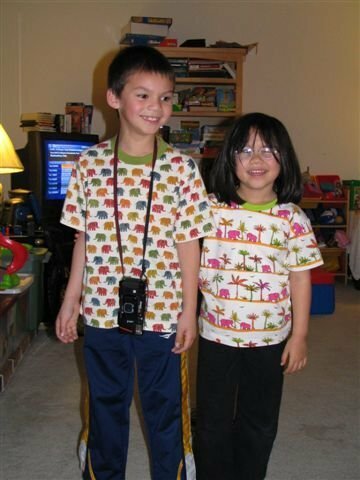 Brad sent a picture this evening of his two children, Evan and Cara, wearing the t-shirts from Jim Thompson Company that Tawn and I bought for them. Trying to figure out what size t-shirts to buy was a major challenge, but it looks like the fit alright. The theme: elephants. What else? I spent the morning working from Anita’s house on projects for IKON. There is a major deadline looming over me and the documents I’m creating seem to take much more time and energy than I’d like them to. But then, if I want them done correctly, I guess I have no choice but to put the necessary effort into them. The afternoon was spent at the office of the SF Int’l Asian American Film Festival (click the link on the left side of this page to learn more) helping prepare for next week’s opening night. The challenge of the day: we need to mount four slide projectors in the projection booths at the theatre so the sponsors’ slide can show on screen. So this means we need some sort of stands on which to place the projectors. Nothing pre-made seems to be meeting the unique space requirements of the Kabuki Theatres’ cramped booths, so I sat down with a pencil, straight edge, and paper and tapped into my long-dormant drafting skills. The initial design, once I went to the lumber store to calculate costs, was a bit pricy, about $80 per stand. A radical redesign, with less structural integrity, whittled the price to about $35 per stand. Hopefully it is sturdy enough to survive a week. I’ll construct them on Friday with the help of an intern. 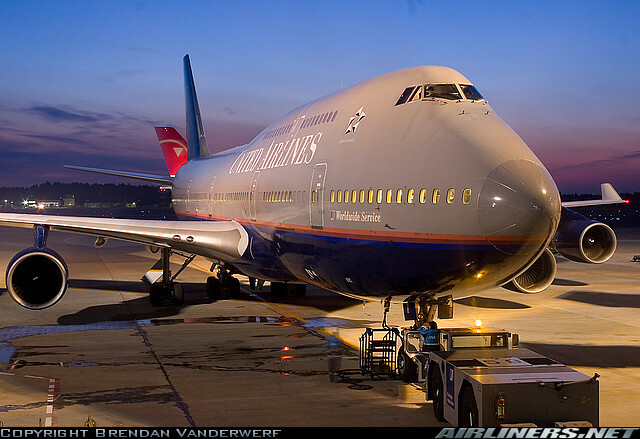 Really awesome photo of a United B747 at Narita on Airliners.net – small version of it is here but you can click here to go see the full thing. Brendan Vanderwerf took the photo and not only captured amazing lighting and color, but also the clarity of the picture is amazing!